Fun fact: The character of Count Dracula, as Bram Stoker wrote him, was likely inspired by a real Romanian ruler named Vlad Dracul III, also known as “Vlad the Impaler.” We’ll leave you to find out why on your own. And while we’re a long way from Stoker’s--or thankfully, Vlad’s--era, your little lady can still act on her vampiric desires and go to her party in style-- Victorian style, that is. The moment she slips into this dark and mysterious outfit she is bound to feel the transformation. Suddenly, her teeth feel just a little bit longer and, maybe, just a little bit sharper. The sun begins to feel just a bit harsher, but that’s ok, she has no interest in getting out of bed until well after it sets. 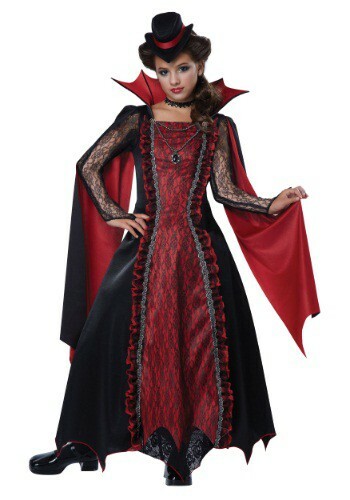 In this Girls Victorian Vampira Costume, your fierce girl gets to feel like a queen, ready to prowl the streets or maybe find her next victim at the Governor’s Ball (she blends in very well with high society, of course). Just remind her to try not to let her taste for blood give her away--we hear that Victorian England does not take too kindly to the vampiric diet. With this pullover dress, she’ll enter every party like royalty...royalty of darkness, that is. Make sure to warn her about that Van Helsing--he always seems to be just two steps behind the freshest hint of vampires. But if you know your little lady--and you do--she’ll slip safely back into bed, just before the first rays of sunrise….only to haunt all over again once dusk falls.